"Every Muslim will be asked about the Zionists' usurpation of al-Aqsa Mosque. Why did he not seek to recover it, and wage Jihad in His way? Did he not care about the fatwa of the ulema [scholars] of the Muslims, 'Jihad of self and money to recover al Aqsa is a duty on every Muslim?'" 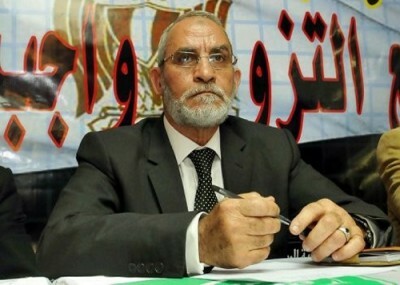 asked Mohamed Badie, General Guide of the Egyptian Muslim Brotherhood, in a June 14th speech translated exclusively by the Investigative Project on Terrorism. The speech from the Brotherhood's Ikhwan Online website is evidence that the group has not moderated its position even an iota, despite assurances to Western audiences. "How happy would be the Muslims if all Muslim rulers made the Palestinian cause a pivotal issue, around which Muslims, rulers and the ruled, would line up," he stated. According to Badie, they would ally to make "the sole goal for all of them the recovery of al Aqsa Mosque, freeing it from the filth of the Zionists, and imposing Muslim rule throughout beloved Palestine." "The Lord of Glory has threatened these murdering Zionists criminals with a penalty of a kind which operates in this world before the Hereafter, he said, before referencing a Quranic quote calling Jews "apes, despised." "We say to our people and our brothers in Palestine (all of Palestine): Unity, unity, persistence, persistence, reconciliation, reconciliation, and patience, patience. Make your motto and your starting point be in confronting the Zionists," he added. Badie also made reference to the role of Hamas-tied convoys, in aiding in the effort to eliminate the Jewish state. "Know that there stands by you every sincere Muslim mujahid from all over the world, and all the honorable nationalists. Do not presume that you are alone in the field, but there stands at your side and with you every free honorable noble man who rejects injustice, murder and bloodshed," he said, before stating, "Not far off are the Freedom flotillas which will come to you from various States, and Miles of Smiles which touched you from all over the world." The most recent convoy by Miles of Smiles, which is linked to the U.S. terrorist designated, British organization Interpal, was led by Jordanian Muslim Brotherhood head Hammam Saeed. Hamas' Prime Minister Ismail Haniyeh called that convoy "the declaration of victory over the siege and the declaration of the enemy's strategic failure in Gaza." The inability of the Muslim Brotherhood to change its rhetoric, leads to questions about how Egyptian President-elect Mohamed Morsi will serve to moderate the Islamist group's beliefs and behavior. Much has been written about how the election of the Muslim Brotherhood candidate isn't a threat to U.S. and Israeli interests in the region, or even to Egyptian society. To take just one example, John Kerry, chairman of the Senate foreign Relations Committee, warned against "prejudging" the Muslim Brotherhood as it prepared to take power in Egypt. "In our discussions," declared Kerry on Sunday, "Mr. Morsi committed to protecting fundamental freedoms, including women's rights, minority rights, the right to free expression and assembly, and he said he understood the importance of Egypt's post-revolutionary relationships with America and Israel." But Morsi was singing the same tune as other Muslim Brotherhood leaders less than two months ago. In a speech obtained and translated by the Middle East Media Research Institute (MEMRI), and aired originally on Egypt's Misr 25 TV, he advocated violent jihad and the renewal of an Islamic theocracy in Egypt. Morsi promised the Quran would be the new constitution of the nation, and then led the crowd in chants of the Muslim Brotherhood's motto. "The Quran is our constitution," "jihad is our path," and "death for the sake of Allah is our most lofty aspiration," the jubilant crowd repeated after Morsi. "Above all – Allah is our goal... The shari'a, then the shari'a, and finally, the shari'a. This nation will enjoy blessing and revival only through the Islamic shari'a. I take an oath before Allah and before you all that regardless of the actual text [of the constitution]... Allah willing, the text will truly reflect [the shari'a], as will be agreed upon by the Egyptian people, by the Islamic scholars, and by legal and constitutional experts," he added. That's the same message of violence and religious extremism that the General Guide Badie has been preaching for years. President Obama issued a press release upon Morsi's victory. "We look forward to working together with President-elect Morsi and the government he forms, on the basis of mutual respect, to advance the many shared interests between Egypt and the United States." That is the sort of statement governments routinely release after elections. The problem, of course, is that talk about "mutual respect" and "shared interests" may very well end up being nothing but empty talk, and that calling something a democracy does not make it so. RE: "But Victoria Nuland, State Department spoksperson says that Morsi and MB are saying all the right things. A mistake by the State Department? Absolutely! If a State Department spokesperson told me what the local weather looked like, I'd get a second opinion. But Victoria Nuland, State Department spoksperson says that Morsi and MB are saying all the right things.